I ordered the cheapest and most basic one — dutum (meaning ‘thick’ in Korean) tonkasu. In the open kitchen, chefs make the pork cutlet from scratch so the size is not always the same. I think I got a little smaller portion, but it was still enough for me. The cutlet was relatively thick, and crunchy outside and tender inside, and the accompanying salad was fresh. For additional rice, kimchi or soup, a self-serve corner is also available to fill up to your hearts content. Upon entering, you should pay at the counter when you order, and then they will cook your meal ready to order and bring it to your table. Don’t be alarmed if you don’t see any utensils and napkins — they are in the drawer under the each table. There are four kinds of dutum tonkasu to choose from; dutum, cheese dutum, curry dutum and punggi at prices ranging from 7,900 won to 10,900 won. 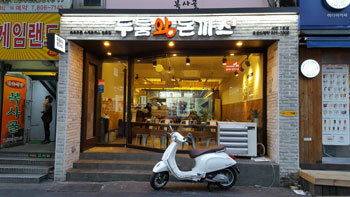 There are five kinds of old-style Korean tonkasu at prices from 6,500 won to 9,900 won. Chicken-kasu is 7,900 won and Chicken cheese-kasu is 9,900 won. 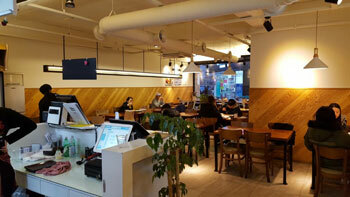 There are noodles also available from 4,900 won to 8,500 won. With any tonkasu, you can order udong for an additional 2,000 won, and a fried egg for 1,000 won. 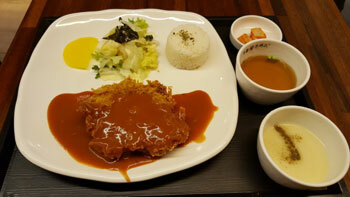 If you want to spice up the sauce on your cutlet, you should tell them when ordering for additional 500 won. Soft drinks are 1,500 won, orange, lemon or grapefruitade is 4,000 won, and beer is 4,000 won or 6,000 won. They have Deoku tonkasu on the menu at 18,000 won, which offers diners an eating challenge to finish a super-sized tonkasu. There is a time limit for a single diner to get through the mammoth portion, though there are only five chances a day for entrants to participate. For those who succeed, there is a Hall of Fame board on the wall with a list of the big eaters names inscribed. If you do complete the challenge, you get your meal for free, and if you’re the fastest that month, you can win a 300,000 won grand prize. If you fail to finish, you will get nothing else but some complimentary antacid, and of course, shamefully pay for your meal. Lunch time is usally packed. Parking is not available, but takeout and reservations are possible. This is the flagship restaurant run by the original owner and there are four more in Busan run by his acquaintances including in Yangjeong and Nampo.